Washington’s 2014 general election may go down in the books as the year of the male Republican voter. 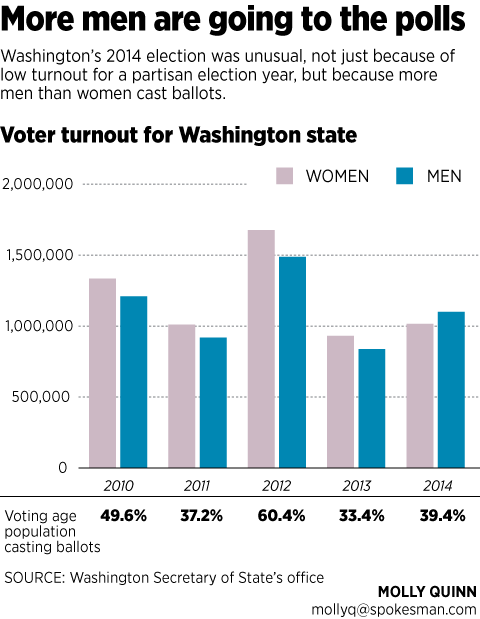 For the first time in a while – it’s not quite clear how long – more men cast ballots in Washington than women. Not just for all voters, but in every age group broken down by state elections officials. That hasn’t happened since at least 2010, the last year for which similar statistics are available, and probably a lot longer. Cathy Allen, a Seattle political consultant, said women may have consistently outvoted men in Washington since 1992, sometimes called the year of the woman because so many female candidates got elected to office. Blaine Garvin, a Gonzaga University political science professor, said the shift may be more about politics than a battle of the sexes, but more detailed surveys would be needed to be sure. “I suspect it’s a partisan thing rather than a gender thing,” Garvin said. • First, there are more women than men of voting age in Washington. While men slightly outnumber women in the state between the ages of 18 and 49, after 50 there are more women and the disparity grows with each passing year. • Second, regardless of whether there are more women or men in a particular age group in the state, more women are registered to vote in each group. The difference is most pronounced in ages 18 to 34, when in the 2012 presidential year – the heaviest year for registration as well as for voting – women were about 10 percent more likely to register than men in those age brackets, even though there were more men in those age groups. • Finally, from 2010 through 2013, more women voted than men in every age group, and the number of votes cast divided by the voting-age population was higher for women in all age groups except for Washington residents over 65. There, the percentage of men voting was slightly higher in some years because their overall numbers were significantly lower. A year ago, 100,000 more women voted than men. In the 2012 presidential election, almost 200,000 more women voted than men. 2014 was also a year with low turnout overall, said Todd Donovan, political science professor at Western Washington University. Women voters tend to lean more Democrat than Republican, and Democrats were less mobilized than in previous years. “Relatively higher turnout for men, in a low election year, would be consistent with relatively higher turnout for people who tend to vote Republican,” Donovan said. As a result of the fall elections, Republicans gained control of the state Senate and narrowed the Democratic majority in the state House. That’s not tied strictly to gender demographics, said Allen, who works on Democratic campaigns. The Republicans seemed to put a special emphasis on close legislative races and recruiting strong candidates while staying away from controversial ballot measures on guns and schools. That was likely different from 2010; the Republican surge in that midterm election was fueled more by tea party-style anger, Garvin added. Turnout was much higher in 2010, and women outvoted men that year by almost 125,000 ballots, figures from the state elections office show. Allen thinks there may have been a “perfect storm” last fall that included new leadership at the top of some traditional Democratic groups, a strong slate of candidates recruited by Republicans, low turnout and Obama’s unpopularity. In the midst of all that, she believes Democratic women around the state may have wearied of being told every year “the sky is falling” and the party was doomed without their help.